Dr. Daniel P. Morin earned his Bachelor of Arts degree from Cornell University in 1995, graduating with Honors and Distinction. He earned his medical degree from the University of Massachusetts Medical School, and his Master of Public Health degree from Harvard University, both in 2000. He then served his internship and residency in Internal Medicine at Tufts-New England Medical Center in Boston, Massachusetts. Thereafter, he completed advanced fellowships in cardiovascular disease and cardiac electrophysiology at New York Presbyterian Hospital - Weill Cornell Medical Center in New York, New York. He is board certified in Cardiology and Clinical Cardiac Electrophysiology. He is a Fellow of the American College of Cardiology and the Heart Rhythm Society. Dr. Morin's clinical interests are in device therapy for cardiac dysfunction (including cardiac resynchronization therapy) and treatment of cardiac arrhythmias via medical therapy and/or catheter ablation. 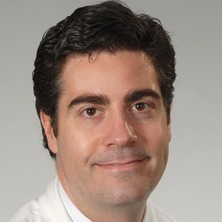 In addition to his full load of clinical work, Dr. Morin serves as Director of Electrophysiology Research and Director of Cardiovascular Research for the Ochsner Health System. He heads an active team researching such diverse subjects as risk stratification for sudden cardiac arrest, new applications for cardiac resynchronization therapy, the effects of ablation on cardiac contractility, and relationships between the environment and cardiac tachyarrhythmias. Dr. Morin has authored over 40 peer-reviewed manuscripts that have been published in prestigious medical journals, including Heart Rhythm, the Journal of the American College of Cardiology, Mayo Clinic Proceedings, and the New England Journal of Medicine. He is active editorially, serving as Online Editor for the Heart Rhythm Society's journals, Heart Rhythm and Heart Rhythm: Case Reports, as well as Associate Editor or Guest Editor for several other journals, and each year completes many peer reviews for many journals. One major focus of Dr. Morin's research is risk stratification for sudden death. Sudden cardiac arrest (SCA) is the most common single cause of death in developed nations, being second only to all cancers combined in terms of number of lives lost. While there exists an effective treatment for SCA (the implantable cardioverter-defibrillator, or ICD), our current screening processes for which patients require ICD therapy is neither sensitive enough nor specific enough. Dr. Morin pursues novel methods of risk stratification, especially including evaluation of ventricular repolarization parameters such as T-wave alternans and the T-peak to T-end duration, as well as circulating markers of inflammation that can be found in the bloodstream. In order to perform these studies, Dr. Morin has received significant outside funding. This work has shown that the use of these parameters has the potential to improve greatly our ability to determine who is at highest risk (and also who is at very low risk), which may help to better determine which patients would benefit most from the effective but expensive implantation of an ICD. Another aspect of Dr. Morin's work is evaluation of novel uses for cardiac resynchronization therapy (CRT). One ongoing project evaluates the effects of acute CRT on cardiac output in patients with severe pulmonary hypertension (pHTN). As you may be aware, pHTN is a highly morbid condition. There exist some medical therapies for pHTN, but still the mortality rate in this condition is astronomical. In patients with severe pHTN, at end-diastole the pressure in the right ventricle (RV) can exceed that in the left ventricle (LV), causing bowing of the interventricular septum into the LV cavity and impeding LV filling. This "interventricular dependence" prevents optimal pump function. Dr. Morin's externally-funded work evaluates whether changing the timing of ventricular activation (including various relative pacing delays between the two ventricles) can optimize cardiac function in patients with severe pHTN. Dr. Morin expects to present the results of his recently-completed protocol at either the ACC meeting or HRS meeting in 2018. Other recent and ongoing collaborative work includes: 1) serving on the steering committee of the international "VEST" (Vest prevention of ventricular tachycardia) trial; 2) evaluation of PET-derived absolute myocardial flow on the incidence of ventricular tachyarrhythmia; 3) assessing the effects of atrial fibrillation ablation on left atrial transport function, as assessed by MRI; 4) evaluation of, and reduction of, inappropriate/wasteful telemetry use in non-critically-ill inpatients as a way to reduce spending: 5) echocardiographic evaluation of degenerative mitral regurgitation vs. rheumatic mitral regurgitation; 6) determining the rate of LV ejection fraction improvement following revascularization of coronary blood flow; and 7) investigating the impact of body habitus on the diagnostic accuracy of SPECT cardiac stress test imaging. Abdelghani S.A., Rosenthal T.M. and Morin D.P. (2016) Surface electrocardiogram predictors of sudden cardiac arrest. The Ochsner Journal, 16 3: 280-289. Jaffe, Leeor M. and Morin, Daniel P. (2014) Cardiac Resynchronization Therapy: History, Present Status, and Future Directions. Ochsner Journal, 14 4: 596-607. Morin, Daniel P. (2003) Is the match illegal?. New England Journal of Medicine, 348 22: 2259-2260. Shams, Omar F., Owen, Joseph S., Saad, Marc A., Khatib, Sammy, Xue, Joel, Rubiano, Andres, Yarbrough, Jamie and Morin, Daniel P. (2010). Among Several Surface ECG Measurements and Clinical Indicators, Only T-peak-T-end and Cornell Voltage Predict Appropriate ICD Therapy In Patients with Ischemic Cardiomyopathy. In: Circulation. , , (). .
Shah, Bindi K., Markowitz, Steven M., Iwai, Sei, Stein, Kenneth M., Dobesh, David, Nemirovsky, Dmitry, Morin, Daniel, Zacks, Eran and Lerman, Bruce B. (2007). Effects of adenosine on canine and human reentrant ventricular tachycardia. In: Journal of the American College of Cardiology. 56th Annual Scientific Session of the American-College-of-Cardiology, New Orleans La, (8A-8A). Mar 24-27, 2007. Morin, Daniel P., Olkarinen, Lasse, Viltasalo, Matti, Tolvonen, Lauh, Nieminen, Markku S., Keldsen, Sverre E., Dahloef, Bjorn and Devereux, Richard B. (2007). QRS duration predicts sudden cardiac death in hypertensive patients: The losartan intervention for endpoint reduction in hypertension (LIFE) study. In: Journal of the American College of Cardiology. 56th Annual Scientific Session of the American-College-of-Cardiology, New Orleans La, (21A-21A). Mar 24-27, 2007. Iwai, Sei, Markowitz, Steven M., Stein, Kenneth M., Shah, Binch K., Zacks, Eran S., Morin, Daniel P. and Lerman, Bruce B. (2007). Electrophysiologic and pharmacologic characteristics of focal right atrial tachycardias. In: Circulation. 80th Annual Scientific Session of the American-Heart-Association, Orlando Fl, (586-586). Nov 04-07, 2007. Morin, Daniel P., Mishra, Rakesh, Shannon, Tracey, Mittal, Suneet, Markowitz, Steven M., Iwai, Sei, Shah, Bindi K., Lerman, Bruce B. and Stein, Kenneth M. (2007). Varying the left ventricular pacing vector affects myocardial performance during cardiac resynchronization therapy. In: Journal of the American College of Cardiology. 56th Annual Scientific Session of the American-College-of-Cardiology, New Orleans La, (19A-20A). Mar 24-27, 2007. Morin, DP, Markowitz, SM, Mittel, S, Iwai, S, Shah, BK, Cheung, J, Tan, V, Dobesh, DP, Nemirovsky, D, Dhruvakumar, S, Lerman, BB and Stein, KM (2006). Effect of bundle branch block on microvolt T-wave alternans. In: Journal of the American College of Cardiology. 55th Annual Scientific Session of the American-College-of-Cardiology, Atlanta Ga, (6A-7A). Mar 11-14, 2006.